Soak garbanzo beans in 4-5 cups of water in the refrigerator overnight. In a heavy-bottomed pot set over medium heat, saute garlic and onion in the olive oil or lard until tender. Add chicken and brown about 5 minutes. Add the chicken stock and garbanzo beans. Bring to a boil, reduce heat to low, cover and simmer about 20 minutes. Remove chicken and set aside to cool. Add the corn cob pieces (if using canned corn instead, wait to add it), potatoes, carrots, and epazote to the soup and simmer 10 minutes. Add green beans to soup and continue to simmer another 10 minutes. Meanwhile, remove chicken from the bones. Add zucchini, chipotle chiles (including the adobo sauce), tomato puree, shredded chicken, and salt and pepper to taste. (Add canned corn at this point if not using corn cobs.) Simmer another 10 minutes or so, making sure the vegetables are tender. 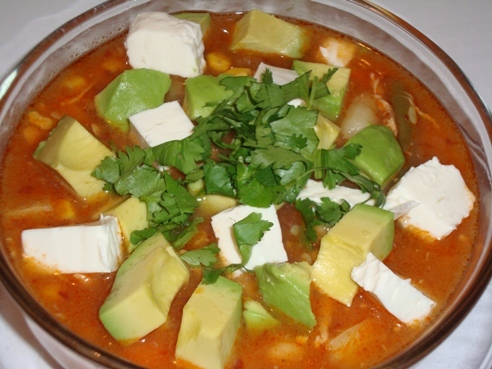 Serve soup hot with cilantro, avocado, limes, and cheese on the side to garnish to taste. This soup is easy to make vegetarian by eliminating the chicken and substituting vegetable broth for the chicken stock – healthy and delicious! This entry is filed under Soups & Stews, Tlalpeño. You can follow any responses to this entry through the RSS 2.0 feed. You can skip to the end and leave a response. Pinging is currently not allowed.